For Ithaca Moms, Dads, and visiting parents who are looking for high quality, reliable, and safe products for parents and babies – your first stop should be Jillian’s Drawers on the Commons pedestrian mall. 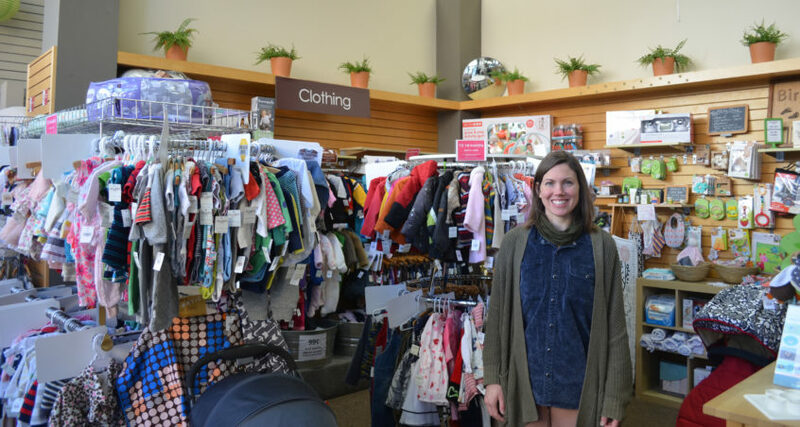 Once you pop in, the friendly face who is there to help you – from classes to strollers – is the Owner and Manager, Kelly Serbonich. Kelly is from a tiny town in Western New York (Basom), but has lived in Ithaca since 2004. In 2018, after Kelly had been a Jillian’s Drawers employee for over 12 years, she took over as Owner and Manager of the store. She has worked in customer service since 1997, and started at Jillian’s Drawers in 2007. At that time, when her son was just 20 months old, she remembers the early days of Jillian’s Drawers when kids played in the basement while they packed orders and answered calls. 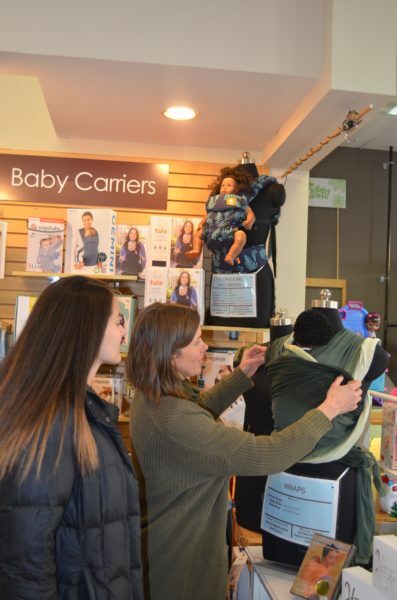 Owner and Manager Kelly Serbonich shows a customer a baby carrier at Jillian’s Drawers. The store has grown since those days, and been on the Commons since 2010, with Kelly helping expand it to the current arrangement. When the opportunity arose to purchase the business, she decided it was the right move because of her experience. “I chose to buy because of my long term connection to and knowledge of the business and because I feel very strongly that we provide important services to the community. I also chose to buy at a time when the business needed some changes and have been excited to implement the changes,” Kelly said. Located right in the middle of the Commons, Kelly loves being a part of the Downtown community. “ I love being at the heart of our small-yet-rich community. It’s lovely being so close to so many other businesses and getting to know other employees and owners, and seeing our downtown locals so frequently. It’s also feels great to refer customers to other local businesses so frequently. Supporting small, local businesses is so important in creating a vibrant community!” Kelly said. When Kelly isn’t in the store, there are a variety of ways you will see her around town. She is a singer in 2 local bands, practices aerial arts at Circus Culture, and occasionally teaches food classes to their Toddler Variety class (She used to be a professional chef!). She loves to stay busy to balance out her work life at the store. The store aims to help parents find solutions in a supportive, non-judgemental way that empowers and helps create community. That community is why Jillian’s Drawers has become a staple of the Downtown Ithaca retail space. To learn more about Kelly and Jillian’s Drawers, visit the store at 171 East State Street on the Commons. Some say the best referrals come from trusted family and friends. In Downtown Ithaca, quality recommendations often come from speaking directly to our hospitable downtown business owners and managers. Afterall, who knows their business best than the business owner themselves. Welcome to Faces of Downtown Ithaca where we’ll give you an insider’s look at downtown’s shops, let you meet your shopkeepers, and restaurateurs who provide this area with some of the finest shopping, dining, and attractions that the Finger Lakes Region has to offer. Not only do these folks work here, but they also dine, shop, and play here. Many of them also live here, too! This is their Downtown Ithaca and now, they are sharing some of their histories with you.